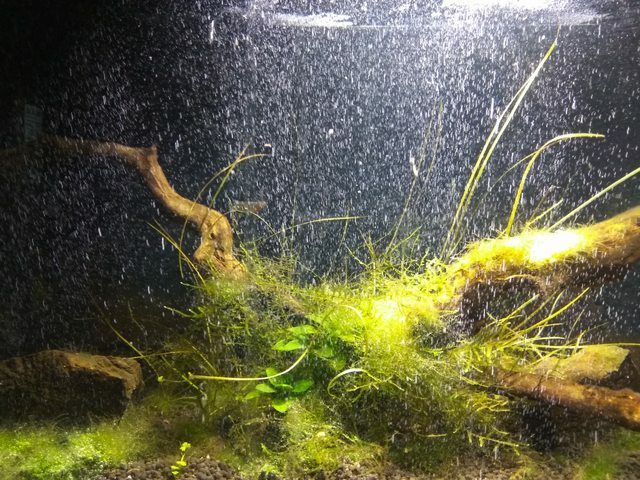 indianaquariumhobbyist.com Forums » Post 358470 » Re: 7G low tech tank Journal. Posted: Tue Jun 19, 2018 11:58 am Post subject: Re: 7G low tech tank Journal. Thanks, Ashwin, So I will go for contra soil. Please provide any link for black blasting sand (i am bit confused). Planning for 1'' contra soil and 1'' black sand is it ok? Posted: Tue Jun 19, 2018 3:09 pm Post subject: Re: 7G low tech tank Journal. Blasting sand is just a medium grit black sand and you can use any inert substrate in its place. You can find blasting sand from fabrication shops as its not available online. As for the tank size, bigger tanks are always much more stable so go for the largest tank you can get within your available space and budget. Posted: Tue Jun 19, 2018 3:37 pm Post subject: Re: 7G low tech tank Journal. Posted: Wed Jul 11, 2018 1:20 pm Post subject: Re: 7G low tech tank Journal. Almost a month has passed. Nothing much to report really. Ive got a terrible case of cladophora since a long time as well as brown algae on glass. I realized the easiest way to keep brown algae in check was to simply clean my glass thoroughly. Did that and now tank looks much better. Silly me lol. Cladophora on the other hand is a menace! I'm planning on spot treating it with H202, at the risk of harming my shrimp. I'm gonna dose it with a syringe, I will update the thread in a week to let you guys know what happened. You can still see specs of brown algae on the glass. Im gonna go at it again this weekend make the glass squeaky clean! 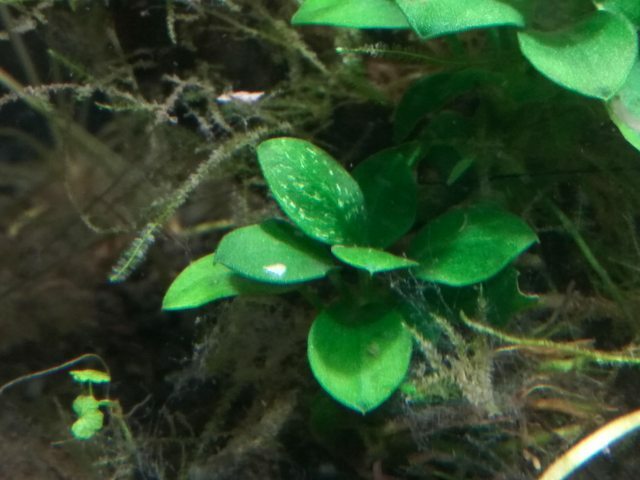 Anubias doesnt seem to be growing now and has developed white spots on some of its leaves. New leaves aren't sprouting but older ones aren't dying either. Valisneria seems to be similar. However the number of leaves that I had to fish out has greatly reduced. I suspect it is the root tabs doing. Hydrocotyle is just 1 tiny sprig of 4 leaves now. It will be a miracle if it grows back from it, however, that tiny sprig is growing new leaves sporadically. I plan on adding a few rotala and cypts and a few floating plant in the coming weeks. The tank has started feeling empty. This means a total of 11Hrs of light a day and a 4hr siesta in the afternoon. This is about 30% increase in the photoperiod, Im gonna see if it triggers better plant growth, or just more algae. Also, the root tabs seemed inadequate. I had added 3 earlier but to no noticeable effect. I added 4 more a day back when I took this pic, Im gonna report back about it too next week. Posted: Thu Jul 12, 2018 12:52 pm Post subject: Re: 7G low tech tank Journal. I got 6% concentrated H2O2 bottle from a local chemist, 200ml for INR27 and one disposable 5ml syringe for INR4. I dosed a total of 8ml on various spots within the tank, after 5 minutes from turning off my filter. Within a minute the entire tank was bubbling! 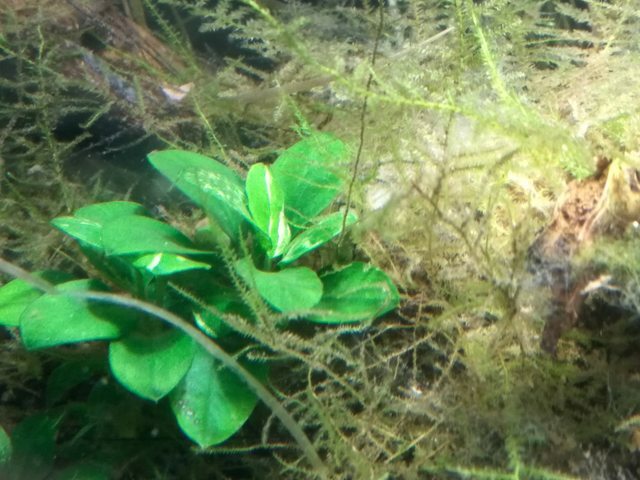 Surprisingly all the bubbles were coming from the cladophora, even at the places where it was intimately entangled with Java Moss, only the algae was bubbling not the moss. I've not done any water change post the treatment and I will perform the weekly change on the weekend. Fingers crossed. Also, post treatment, I saw fish and shrimp both nibbling at the cladophora as well as diatom on the glass. In the morning I even saw tiny flakes of diatom chipped off from the class. Everything looks promising. 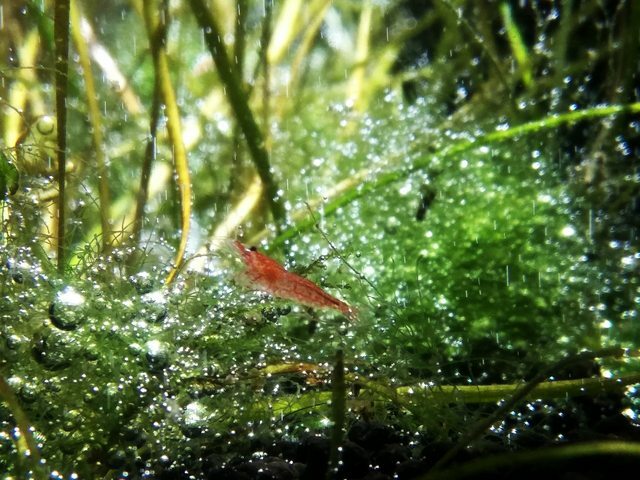 On another note I dont know if it was the turned off filter or the H2O2, but several tiny shrimplets emerged in the tank the moment bubbles went up! I used to see just 1 or two shrimp rarely. I thought there were no more. But this new discovery means that the shrimp are thriving inside the cave system formed by rocks and driftwood, encased in the java moss blanket! Posted: Thu Jul 12, 2018 4:50 pm Post subject: Re: 7G low tech tank Journal. Posted: Thu Jul 19, 2018 1:10 pm Post subject: Re: 7G low tech tank Journal. Small Update: Its been about a week since the treatment. I didn't do any more sessions as I could see the cladophora dying already. After a week, almost ALL of it has turned white. Plants have remained unaffected. Growth seems to have increased marginally. I think Valisneria Nana, has different requirements than other Vals, Ive been able to grow Valisneria Spiralis quite easily in my 125G tank in an inert substrate. Nana However doesn't seem to be growing at all. Googling hasn't yielded any result for any form of deficiency which leads me to believe it might just be normal for this particular individual. Increase in the photoperiod has lead to better growth in the plant and it sprouted a new leaf almost immediately. It had these markings before the H2O2 treatment. Posted: Thu Jul 19, 2018 3:51 pm Post subject: Re: 7G low tech tank Journal. Posted: Tue Jul 24, 2018 10:31 am Post subject: Re: 7G low tech tank Journal. I wasn't aware of it untill i started checking the interwebs for the reason why my Valls were dying. It turns out H2O2 will kill at least Valls, Blyxa species and Riccia. There are a few more which can tolerate only low doses. Be careful with this treatment. Both Hydrocotyle Tripartita and Hydrocotyle Sibthorpioides have started growing once I increased the photoperiod. Day before yesterday I added another 4700k 7W LED to the mix and growth has increased by quite a bit. Its really surprising! Sibthorpioides was just one tiny sprig with 2 leaves while tripartita was slightly better off with around 5 leaves. Both are less than 3cm long, over just a few days of the new light they've gained atleast 2 leaves each and are looking really good. 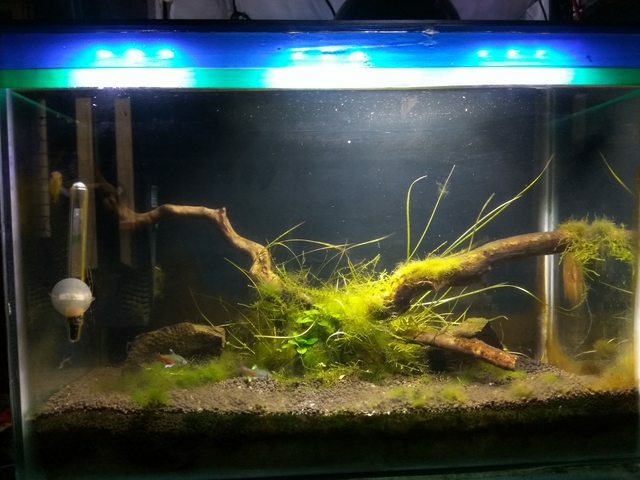 Im gonna siphon off the valls, and add a few crypts, echinodorus and maybe rotala.